 Whitby Holiday Park is located perfectly on the cliff tops overlooking Saltwick Bay. The Cleveland Way Footpath runs right through the park so you have the choice of taking the footpath towards Whitby town centre which is only approx 1 mile away along a gravel path that leads to Whitby Abbey and then it is a short walk down the iconic 199 steps at the Church. At the bottom of the 199 steps you can head on down to Tate Hill beach where the Russian ship Demeter ran aground. This shipwreck was included in Bram Stokers book Dracula. If you are feeling more energetic you can walk along the Cleveland Way footpath away from Whitby which will lead you to Robin Hoods Bay. This walk is not for the faint hearted as you ramble through fields and explore little wooded areas as you meander towards Robin Hoods Bay. On your way into Robin Hoods Bay why not pay a visit to St Stephen's Church which dates back to 1822. The interior is virtually unaltered and holds memorials to shipwrecks of the area. Heading on down to bay as you pass many winding alleys and passages of houses of different character you will see the smuggling history come alive. 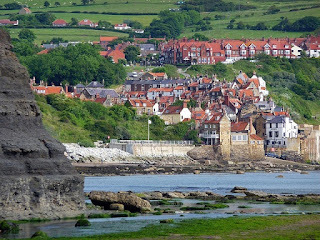 To read up on the history of smuggling in the area you should call into the Robin Hood's Bay Museum which is housed in what used to be the Coroner's Room and Mortuary! At the bottom of the Bay you will find yourself stood outside the Old Coastguard Station which houses the Nation Trust's Visitor Centre, where you can find out more about the marine life of the Bay. 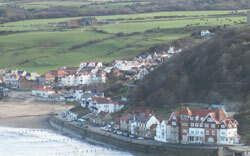 If you head north of Whitby the next little village you come to on the coast is Sandsend. Sandsend is a complete contract to Whitby. With 3 miles of beach area, it makes a great place to sit with a picnic to watch the world go by. With a little coffee shop/Cafe and a great place to have a cold refreshing drink and lovely meal at The Hart Inn, you can easily while away an afternoon. If sitting on the beach for a couple of hours isn't your thing, then the entrance to Mulgrave Woods is just on your doorstep. With lots of paths to lead you in different directions around the woods, try and see if you pick the right one that will lead you to the ruins of Mulgrave Castle! Once there you will see that you will have spectacular views of the countryside around you. These woods have become a firm favourite of locals and visitors alike! It's ideal for dog owners as all dogs love a new area to investigate! When I was younger it was the place we went to collect conkers in Autumn! Heading further north away from Sandsend you will see signposts for Runswick Bay. You will see the road dips and all of a sudden you will see a picture postcard of cottages alongside a lovely sweeping bay. heading on down the steep bank to this lovely village you will see tiny paths that lead to the cottage and to a cafe and 2 hotels where you can take refreshment and grab something to eat! Local folklore states that you may catch sight of a Hob Holes, which a small caves said to be where hobgoblins lived. This included one who was supposed to cure whooping cough, so the local mothers took their ailing children there and called out a rhyme, asking for a cure!! The cleveland way walk runs along to Staithes. 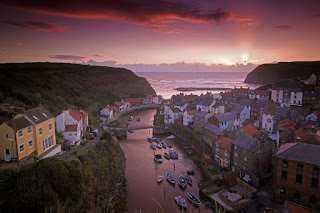 This brings you out at the bottom of Staithes where this little fishing village lies! 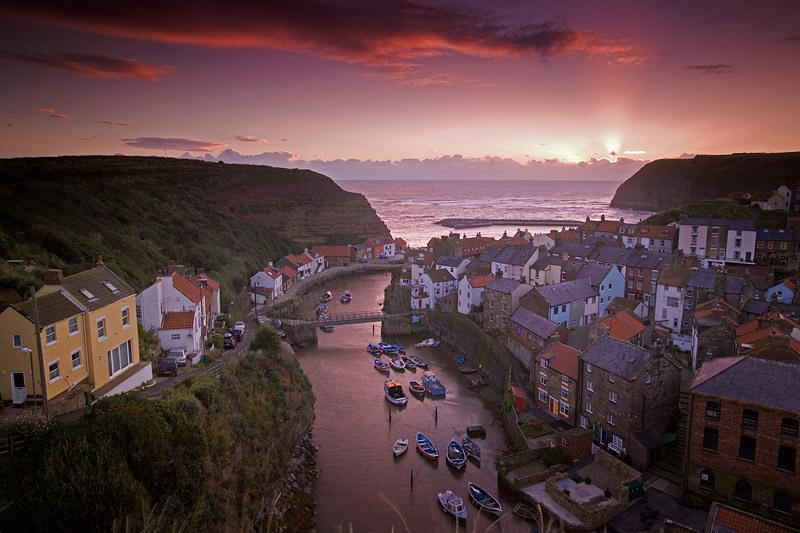 This village may be familiar to those of you with children or grandchildren who watch the CBeebies channel, as this is the location where Old Jack's Boat is filmed starring Bernard Cribbins. With lots of little alleys to explore you can soon work up an appetite! There is a fabulous place called the Cod and Lobster who serve lovely meals right on the harbour front! So as you can see we are located in the perfect place to go off and explore all these wonderful little villages. They are all accessible by either foot for those of you who love walking or by car as there are plenty of car parks in the area. If this looks like something that you would like to do, then why not come and stay with us! We have a lovely grassed touring field with some superb views, or if you don't own a touring caravan or motorhome, you can come and stay with us in one of our hiring accommodation caravans. If you are a dog owner, then thats not a problem as we are very pet friendly and we have some pet friendly accommodation too, so your pets get to come on holiday too! !